There are several beautiful small islands in the Andaman Sea, which you can visit either within a day trip from Phuket or Krabi or spend there several days. One of those are Ko Phi Phi islands (Ko Phi Phi Don and Ko Phi Phi Leh), lying close to Phuket or Krabi. 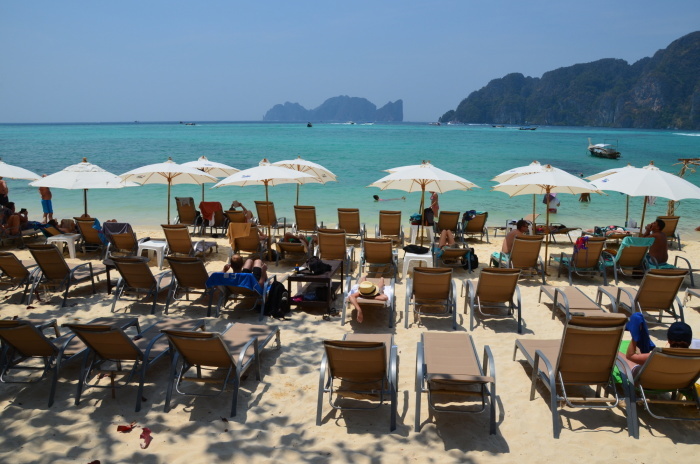 Here are some essentials about what you need to know before going to Ko Phi Phi – how to get there, where to stay and what to do. 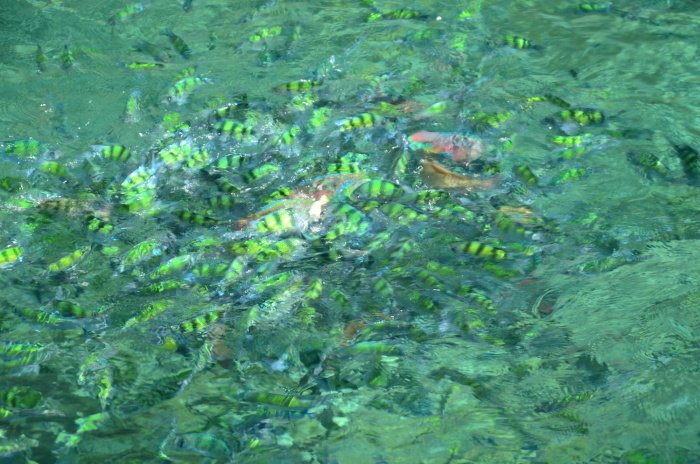 Ko Phi Phi Leh is the smaller island that is also a part of a marine national park. It is an excellent choice for lovers of nature, snorkeling and scuba diving. Ko Phi Phi Leh has a well known beach Maya Bay that was starring in a movie Beach with Leo DiCaprio. The island is uninhabited, but receives tons of tourists each day. 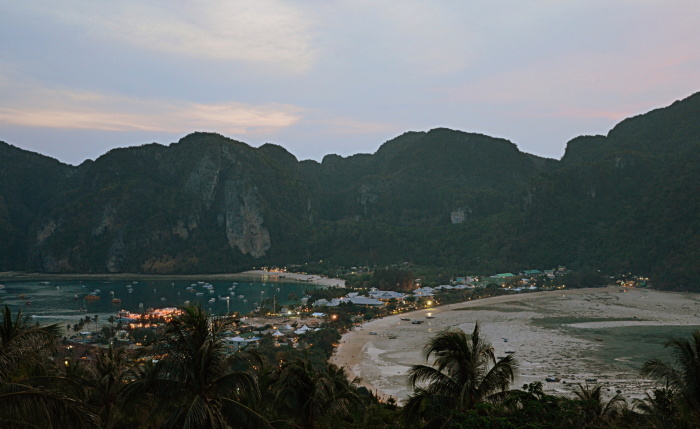 Untill 2012 it was possible to spend a night in a tent on Ko Phi Phi Leh, but today the only option how to see the sunrise on this island is to spend a night on a boat. Ko Phi Phi Don is the larger island and it is here where you find acommodation and all the trips such as to the Bamboo island, Phi Phi Leh, scuba diving and others are organised from this island. There is a village called Tonsai which is the center of the island – you will find there many restaurants, bars, internet cafe’s, laundry services, tatoo salons, massage salons, shops and a small market. There are no cars on the island and the thin roads are made for bikes and pedestrians. If you need to get to some other part of the island, you need to take the taxi-boat. Beware that the majority of the local inhabitants are Mussulmans so you need to respect them, which means try to avoid alcohol consumption in the public places and cover yourself properly once you leave the beach. You can get there either via organized day trips from Phuket, or by a ferry if you plan to stay longer on the islands. The ferry leaves from the neighbour islands or Krabi and stops at Tonsai village in Ko Phi Phi Don. There are several resorts on the island, but as mentioned previously, there are no cars at all on the island and the only transport means are bikes and boats, otherwise walk. If you are staying far from Tonsai village, you will need to take the taxi-boat and these are always waiting for the newcomers at the harbour. 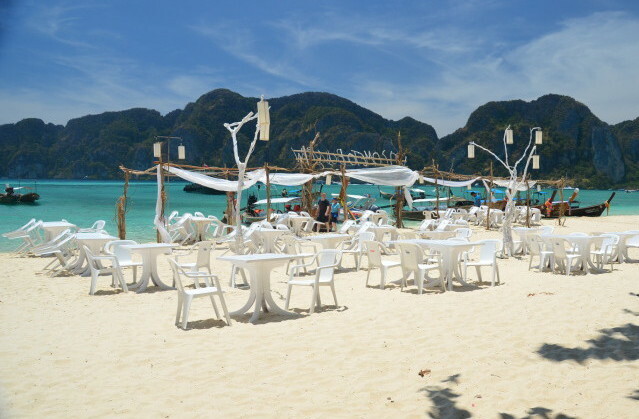 Where to Stay on Ko Phi Phi Don? If you are looking for a lively place, then you should look for accommodation in the Tonsai village. The Tonsai beaches Tonsai Bay and Loh Dalam are famous for their night life – there are many bars around, lot of noise and wild parties going on. Try to avoid especially the neighbourhood of Loh Dalam Bay if this is not your cup of tea. In case you prefer some calm place but not far from the village, go for some accommodation on the southern part of the island. You can then enjoy a dinner in Tonsai village and afterwards spend a calm night. For this purpose, Bay View Resort, lying between Tonsai village and Long Beach, is a great option. 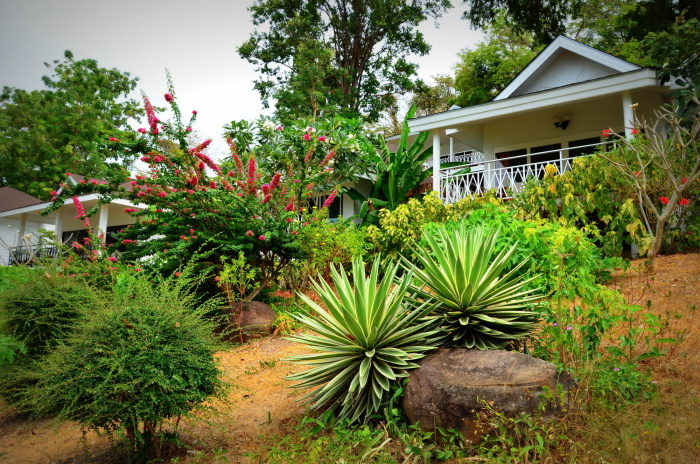 Cozy bungalows built in the hillside in a beautiful garden, offer a nice view of the sea and Ko Phi Phi Leh. The resort has its own beach, the only downside here is the low tide. Usually after 3 p.m. there is no more water, so you need to enjoy the water before. Tonsai village is about 10 min walk, which is indeed good for dinner outside, even though the resort has its own restaurant (on the beach) too. If you want to stay far away from the crowd, then focus on the Northern part of the island. 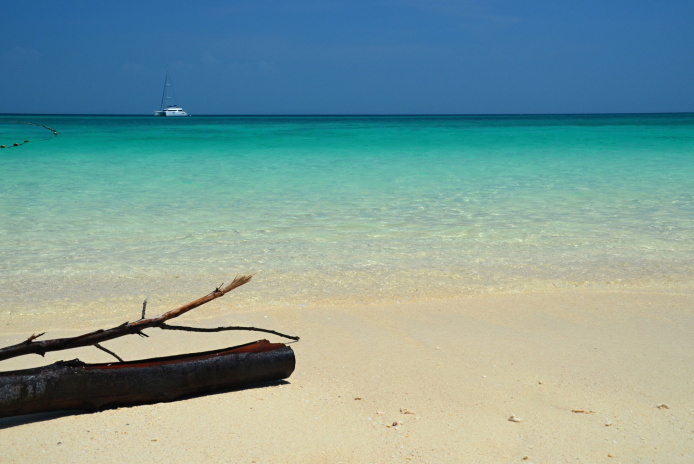 You will find beautiful resorts and beaches there, accessible by taxi-boat. 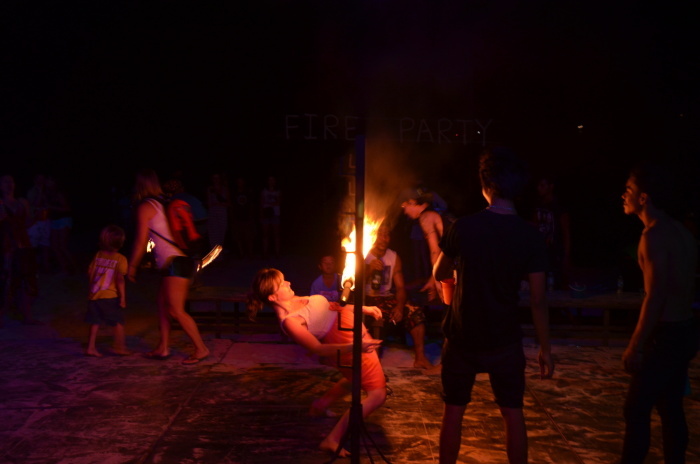 What to Do in Ko Phi Phi? One must-do activity whether you are staying a day or a week in Ko Phi Phi Don, is to take a hike to the Viewpoint, the highest point on the island. After the 30-minutes’ hike through the jungle (there is a kind of path), you will enter a tropical garden from where you can see the Western part of the island, including Tonsai Beach and Loh Dalam Beach, but also Ko Phi Phi Leh. How to arrive to the Viepoint: from Tonsai village, you follow the sign “Tsunami Evacuation Route” and then “Viewpoint 1”. Count more or less 2 hours in total for the hike. There is a small entry fee and you can get some refreshments at the Viewpoint, so take some money with you. 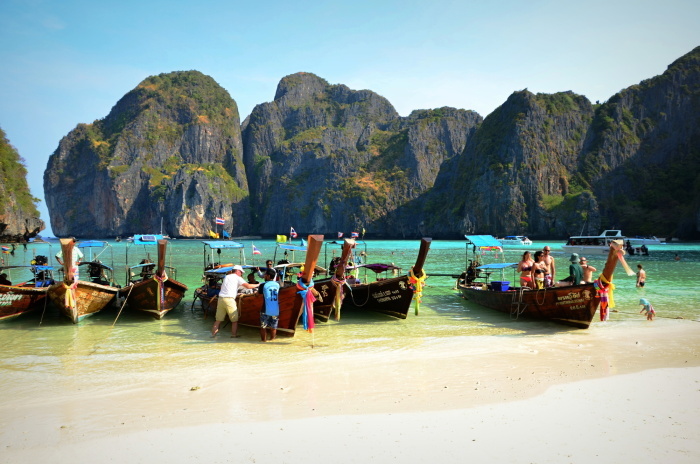 Ko Phi Phi Leh is famous for its beach Maya Bay known from the movie with Leonardo DiCaprio. You can also discover the rest of the island within the time frame given to you by the driver. Ko Phi Phi Leh is accessible by long-tail boat from Tonsai village which takes about 30 minutes and costs about 1500 Baht (plus some entry fee to the natural reserve), and if you are lucky, than some taxi-boat will take you there from other parts of Phi Phi Don. The Beach is usually full of tourist boats as from 9 a.m. so the sooner you arrive, the better. If you would like to experience a night there, it is only possible on a boat. The boat leaves from the Tonsai Pier at 3 p.m. for afternoon snorkeling and then discovering the beach after the majority of tourists leave, with evening barbecue, music and night swimming. You sleep on a boat and at 10 a.m. the boat returns to Phi Phi Don. Bamboo Island lies on the North of Phi Phi Don. 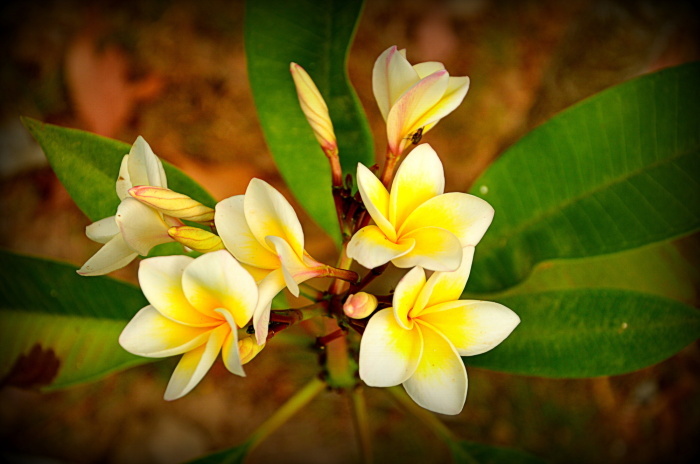 It is a tiny island with white sandy beaches, covered with a forest. The water is turquoise and clear and not that many people around as on Maya Bay. You can stay here some time and enjoy swimming and sunbathing in a paradise. 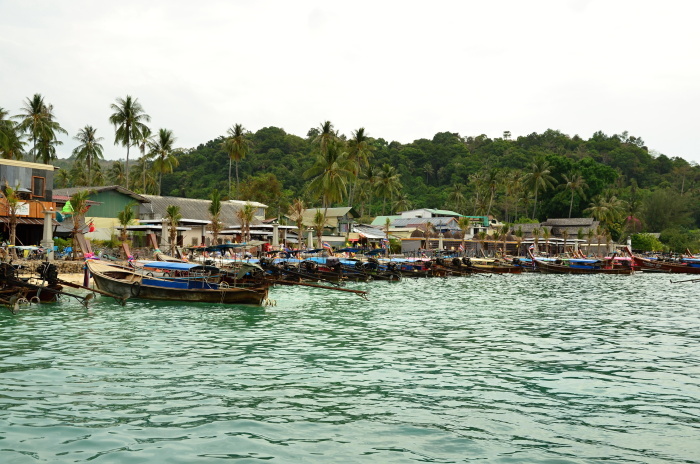 You can get here from Tonsai village by long-tail boat, which takes about 1 hour and costs 1500 Baht for a roundtrip. Do not forget that you will pay again some entry fee as you are in the natural reserve. If you like scuba diving, there are several agencies offering scuba diving trips and courses in Tonsai village. You can also rent snorkeling equipment. The Andaman Sea and the nearby marine national park are full of colourful life. There are plenty of restaurants in Tonsai village, but I can only recommend one where we ate twice and it was delicious and the service was very nice! The restaurant is called Pum Restaurant & Cooking School and it is a nice place to take courses of Thai cuisine. I met Pum personally, she is really sweet and kind. 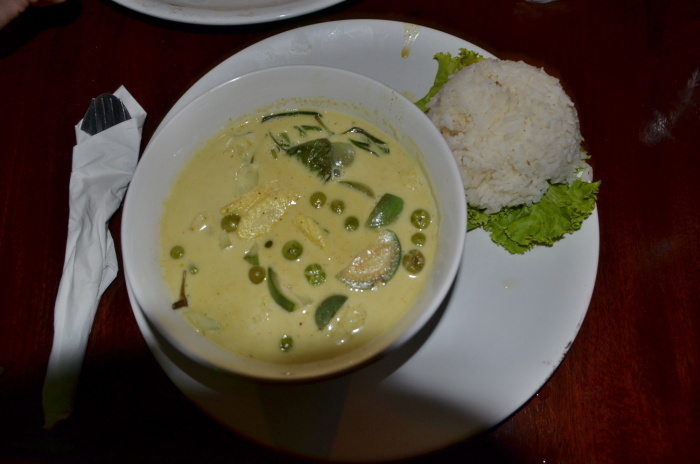 We also had a wonderful green curry with rice somewhere close to Loh Dalam, but unfortunately I do not recall the name of the restaurant. 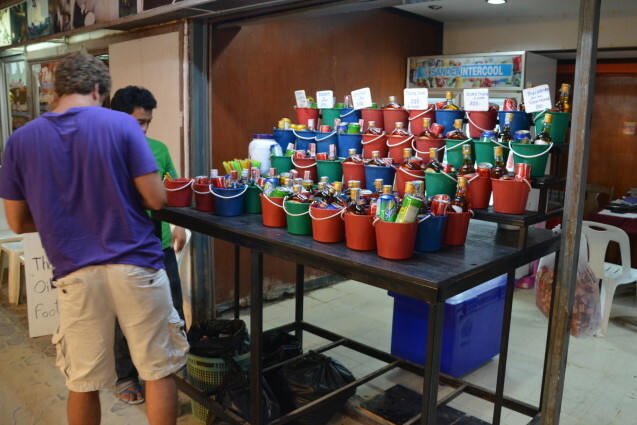 Regarding shopping in Ko Phi Phi, bargaining does not work here on many places. 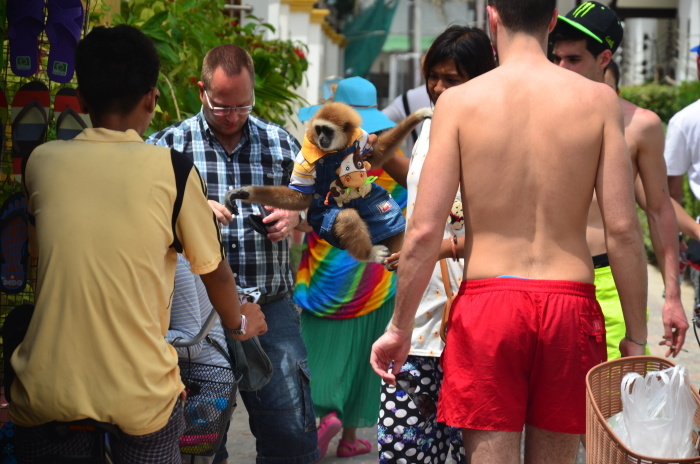 Too many tourists in Koh Phi Phi led to fixed prices in some shops, so you will have more difficult to get a great deal. Also remember that souvenirs, often similar to what you see in Bangkok or Krabi, are more expensive here because of the transport. Have you ever been to Thailand? If so, which island did you like the most? If not, which island would you like to go? Comment, share and enjoy Ko Phi Phi if you plan to go! 1001VG Nominated for the Liebster Award! The Phi Phi Islands are on my bucket list. Living in this part of the world, I have no excuse now! That water could not be a more beautiful colour! I was telling a friend that I want to go to Chiang Mai and take Muay Thai and Cooking Classes, but after seeing your green curry and beach photos I might have to get into that island vibe. Awesome!